The White Helmets members are preparing new provocations with chemical weapons in Syria offering local residents to participate in filming staged attacks in exchange for food, a spokesman for the Russian Defense Ministry said on October 31. Sputnik discussed the potential for a planned staged attack at the gathering with Francesca Totolo, writer and researcher of the Italian independent press. Sputnik: What do you make of the reports of a planned staged attack by the White Helmets? How likely is it to take place? Francesca Totolo: Another false attack with chemical weapons staged by the White Helmets is very likely because Idlib is the last stronghold of Islamist terrorists. Syrian President Assad, with military support from Russia, is planning the final attack that will mark the end of both the Islamic State* and the NGOs made in UK. So as soon as they get the chance, the White Helmets will not miss the desperate possibility of propaganda in the West. And opinionists, journalists and mainstream media are ready to scream against the "bloody dictator" Assad. This will be the last chance to call for an allied military intervention and a new UN resolution. Syrian territory resources are too important for Western neocolonialism, which will not easily resign themselves to the loss of these. Sputnik: Recently, US Secretary of Defense James Mattis said that Syrian President Bashar Assad will ultimately have to be "managed out of power". What do you make of the timing of this statement and reports of the White Helmets provocation? Francesca Totolo: We know perfectly well that the White Helmets, like dozens of NGOs invading the Syrian territory, were financed by the American USAID, a State Department agency that was set up to "export democracy" in the world. In fact, Syria was the first American war fought with a "humanitarian invasion", and started under the pretext of the Arab Spring. American public opinion would not tolerate another failed war, like in Afghanistan and Iraq. Above all by the Nobel Peace Prize, Obama. Now that Assad has almost concluded the liberation of his country, thanks also to the support of Russia, the United States and other Western states will try to act diplomatically to prevent the Syrian president from remaining in power. And, as already happened before, the "allies" will find great support in the United Nation. Sputnik: What is the end-game of any provocation of this sort on the Syrian soil? Who profits from it and how? Francesca Totolo: The White Helmets, the Islamist terrorists and the "allies" will play 8 years of war, and the relative economic resources, on this probable last provocation. If another false attack with chemical weapons occurs, it will be the most bloody, with many real victims. The images of dead children agonizing will be disseminated by the mainstream media, in order to raise awareness of international public opinion and motivate an allied military intervention. As I have already written, Western neo-colonialists want the resources of the Syrian territory. And let us not forget the demonization of Russia as an ally of Syria, supported by the progressives against the advancement of the sovereigns and the "populists". Sputnik: Meanwhile, Canada accepted the White Helmets members and their families. How concerning is it considering the group's record? Francesca Totolo: In my opinion, the Russian permanent mission to the European Union is right when it states that the evacuation of the White Helmets from Syria proves that the states organizing the operation were seeking to cover up the provocative actions of the self-proclaimed humanitarian group. As usual, just follow the money. The White Helmets were financed by Western states, as stated on their website. And for this reason, maybe someone thought they could reveal the inconvenient truth if caught by the Syrian army. The members of the NGO with their families, thanks to Israel, have managed to escape from Syria, and to reach Europe and Canada. The latter welcomed 117 White Helmets, also thanks to the ultra-progressive ideology of Prime Minister Justin Trudeau. Sputnik: How credible are the White Helmets in the eyes of the Western public? How much is the ‘humanitarian group' narrative supported in your country? Francesca Totolo: From what I have seen in recent times, Western public opinion has become much more aware of the war in Syria and the False Flag that have been created to conceal what was really happening since 2011. This has been possible thanks to journalists independent who have unveiled the lies of mainstream media. In Italy, even if the major newscasts and newspapers still try to sanctify the White Helmets, the birth of a vast network of counter-information has contributed to spreading correct information, highlighting all the opacities of the Syrian Civil Defense Group's commitment and the relative support of the allied forces. 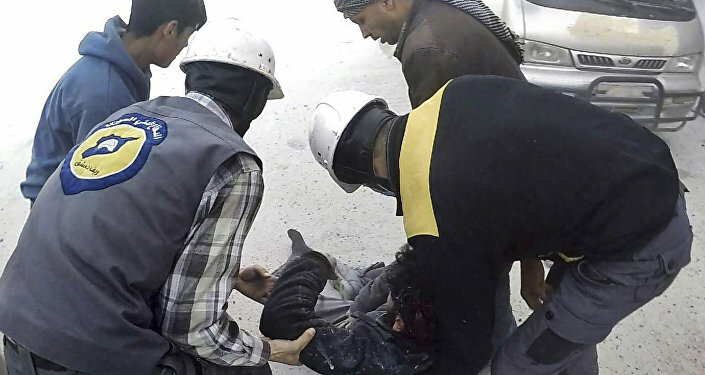 One of the strongest supporters of the White Helmets in Italy is the writer Roberto Saviano, who last April had launched a campaign against President Assad, following the false attack with chemical weapons in Douma. Fortunately, the credibility of the author of "Gomorra", who in Italy also supports the flow of illegal immigration, is rapidly falling. The crisis in the publishing sector in Italy is the sign that Italians have become more skeptical and critical about the information disseminated by the mainstream media. The views expressed in this article are solely those of Francesca Totolo and do not necessarily reflect the official position of Sputnik.